The two featured Kentucky Derby prep races this past weekend, the Grade 2 Louisiana Derby presented by Twinspires.com at the Fair Grounds and the Sunland Derby (G3) at Sunland Park, offered a significant amount of Derby qualifying points to each winner. The biggest beneficiary was Louisiana Derby winner Noble Indy, who received 100 points for his victory and moved up to seventh position in week nine of the National Thoroughbred Racing Association (NTRA) Top 3-Year-Old Poll, results of which were released today as the “Road to the Kentucky Derby” continues. Holding their position for another week in first and second on the ladder are Bolt d’Oro (31 first-place votes; 446 points) and McKinzie (13 first-place 416 votes; points) respectively. Trained and owned by Mick Ruis, Bolt d’Oro has 64 qualifying points and is in second place on the Kentucky Derby Leaderboard. The son of Medaglia d’Oro and Bob Baffert trainee McKinzie are both being pointed towards the Grade 1, $1 million Santa Anita Derby on April 7 where a much anticipated rematch is expected between these two sophomores after a controversial outcome in the San Felipe Stakes where Bolt d’Oro was placed first when the Santa Anita stewards disqualified McKinzie for interfering with his rival in the stretch. McKinzie currently is tenth on the Kentucky Derby Leaderboard with 40 qualifying points. The 20 horses with the most points will earn a spot in the starting gate on the first Saturday in May. Last week’s Rebel Stakes winner, Magnum Moon (1 first-place-vote; 275 votes), remains in third place for trainer Todd Pletcher and, with 50 qualifying points, is fifth on the Kentucky Derby Leaderboard. In fourth and fifth, respectively, are Audible (228) and Good Magic (224). Audible, another trainee of Todd Pletcher for owners WinStar Farm, China Horse Club and SF Racing Stable, has 10 Kentucky Derby qualifying points and is in 28th place on the Leaderboard. His next start is the $1 million Xpressbet.com Florida Derby (G1) at Gulfstream Park March 31, where the qualifying points are worth 100-40-20-10 to the first four finishers. Eclipse Award-winning Champion Two-Year-Old Male Good Magic is trained by Chad Brown for owner Stonestreet Stables LLC. The 2017 Sentient Jet Breeders’ Cup Juvenile winner could go in either the Wood Memorial or the Blue Grass Stakes on April 7. Good Magic has 34 points on the Kentucky Derby Leaderboard and is eleventh in the rankings. Rounding out the top 10 are: Justify (166); Noble Indy (157); Promises Fulfilled (149); Solomini (116) and Enticed (115). The NTRA Top 3-Year-Old Poll is the sport’s most comprehensive survey of experts ranking the generation of Thoroughbreds that includes all Triple Crown contenders. Every week eligible journalists and broadcasters cast votes for their top 10 horses, with points awarded on a 10-9-8-7-6-5-4-3-2-1 basis. The Top 3-Year-Old Poll concludes June 11 after the Belmont Stakes. The NTRA Top Thoroughbred Poll for horses four and up shows slight changes as most of the top 10 are still gearing up for the 2018 season. Eclipse Award-winning Champion Three-Year-Old Male West Coast (31 first-place votes; 443 points) retains first place for trainer Bob Baffert and owners Gary and Mary West. In his most recent start the son of Flatter finished second to Gun Runner in the Pegasus World Cup Invitational (G1) at Gulfstream Park. West Coast will make his next start this Saturday, March 31 in the $10 million Dubai World Cup Invitational at Meydan Racecourse in the United Arab Emirates. Eclipse Award Champion Female Sprinter Unique Bella (2 first-place vote; 327 points) remains in second on the ladder. Trained by Jerry Hollendorfer, the daughter of Tapit did not race in the Santa Margarita Invitational (G1) as expected due to of cough and is now being pointed towards the Grade 1 Apple Blossom on April 13 for her next start, according to her Hall of Fame trainer. Rounding out the top-ten are: Roy H (1 first-place vote; 296 points); Forever Unbridled (1 first-place vote; 254 votes); Accelerate (227); World Approval (161); Gun Runner (11 first-place votes; 137 points); Gunnevera (124); Abel Tasman (123); and Sharp Azteca (87). 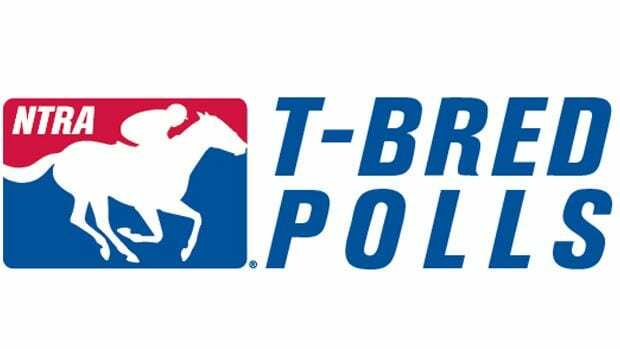 The NTRA Top Thoroughbred Poll concludes November 5 after the running of the Breeders’ Cup.